The following was written by Pete Crapia, founder of the Bachelors Grove Cemetery & Settlement Research Center. A great appreciation goes out to all of those that have and continue to contribute to the research efforts! Reports of a red light date back as far as 1984. The first known sighting comes from an overnight investigation of the cemetery conducted by researcher Norman Basile of Illinois. The earliest written record can be found within a 1984 Chicago Sun-Times newspaper article where Basile is quoted as saying, "I've seen streaking red lights." which is in reference to the sighting of a yellow humanoid apparition. During the Summer of 1984, at 10:00 P.M. Basile and one of his associates were attempting an overnight "camping" excursion within the cemetery. A few hours after their arrival his associate witnessed a yellow apparition near some trees. A moment later they both witnessed "red streaking lights, and watched in disbelief as a single tree began to shake frantically." Out of fear, his associate gathered their equipment and they both immediately left the area. Through the assistance of researcher Dale Kaczmarek, President of the Ghost Research Society in Oak Lawn, Illinois, details of the yellow man sighting found its way into the 1989 book True Tales of the Unknown: The Uninvited by Sharon Jarvis. Also within the book is the origin to the story of red lights that have been witnessed on the main path south of the cemetery, which was a portion of the Midlothian Turnpike at one time. On page 59 it goes on to describe a"phantom red rocket" that moves up and down the path as it leaves a "red trail in its wake." The light, which is also described as "fiery red", has been witnessed moving rapidly down the trail where it would stop, hover, and head back in the same direction from where it started while repeating the same pattern of movements. It is said that at first the red lights were thought to have been the prank of teenagers using Roman candles or bottle rockets. The repeating characteristics of the light, however, indicate that a prank using fireworks was not possible. 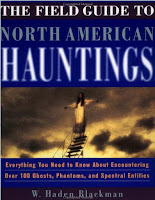 The 1998 book The Field Guide to North American Hauntings by W. Haden Blackman mentions the sighting of the yellow apparition as well. On page 72 it states, "One of these floating orbs took the shape of a yellow phantom. Seconds later, the ghost dissipated in an explosion of shooting red lights." This reference to the sighting, however, has been found to be misleading and partially false. The original report never indicated any "orbs" nor did it specifically describe an "explosion" of red lights at the exact moment the apparition disappeared. For further details, the section on the legend of the Yellow Man should be consulted. 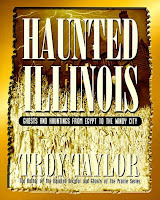 Another misleading statement can be found within the 1999 book Haunted Illinois by Troy Taylor. On page 261 it states, "One such light that has been reported numerous times is a red beacon-like object that has been seen rapidly flying up and down the trail to the cemetery." At present, none of the reports to a red light witnessed on the path south of the cemetery have ever stated it was "beacon-like", such as if the light had ever occasionally faded from view while it was in motion. The statement was then reprinted within the 2000 book Beyond the Grave by the same author. Found within the 2003 book Voices from the Chicago Grave by Scott Markus, it states that in the late 1990s Adam R. Rotsch "said that red lights were flashing throughout the cemetery in a way that it looked like they were 'dancing' with the green light periodically given off by fireflies." This sighting indicates that the red lights were not on the path south of the cemetery, hence it has no relationship to the "beacon-like" reference given by Troy Taylor. Author Cameron Banks stated within his 2004 book Ghostly Graveyards and Spooky Spots that"glowing balls that float through the air appear in many different sizes and in color such as blue, red, orange, and white." Such a sighting is found within an undated report given by Katey (private). She stated,"I have seen a red ball of light in the cemetery before. It was at least six feet off of the ground and floated around." A multiple red light sighting is also included within a separate undated report by John Sobieck of Illinois. Sobieck stated that at approximately 12:00 A.M. he and his brother witnessed a few deer exiting a hole in the cemetery gate near the pond. A few seconds later he "noticed two green globes float across the graveyard." He also went on to state that his brother "says they were red, and it is a debate amongst us, but then again I have never heard of green globes in any ghost reports." At one time the photograph displayed on the right-hand side was presented by Stacy McArdle at her now defunct website of hauntedpages.com. It is unclear as to the exact date it was captured, possibly in the very late 1990s, but it was labeled as capturing both a blue and red source of light within the cemetery. McArdle is known for identifying an unrelated hoaxed paranormal photograph of Bachelors Grove cemetery and convincing the perpetrator into admitting it. Based upon this statement of credibility it is up to the reader to decide if this photograph represents the same, or alternative, red light reported by eyewitnesses.